Today we celebrate a day started by beekeepers FOR beekeepers and to develop awareness of the community about the facts and the benefits of honey. Observed on every third Saturday in August, this day is designated to honor honey bees and those noble beekeepers. 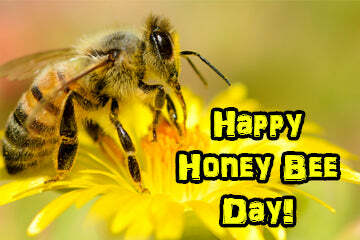 Honey Bee Day was started almost a decade ago by a little group of beekeepers. They made their dream come true by petitioning for a formal proclamation by the United States Department of Agriculture (USDA) that honored honey bees and beekeeping alike. The bee industry community has made great advancements thanks to Honey Bee Day which has opened up the opportunity for beekeepers across the nation to share methods, education, and further efforts to share the best in beekeeping techniques among one other. Did you know that honey bees contribute a lot more to the world than just honey? A LOT more. I’m sure you know that bees pollinate our crops, but did you realize that an entire third of the food we eat hinges on this furry, little insect actually? That’s right! We rely on honey bees for an incredible list of produce such as apples, avocados, blueberries, broccoli, cranberries, cherries, cucumbers, grapefruit, melons, onions…the list goes on and on. Certain foods, such as almonds, rely entirely on honey bee pollination. There are some beekeepers that produce and sell honey while other beekeepers’ business is all about ensuring there are bees to pollinate our farmers’ crops. Without them, so many crops (like the ones listed above) would disappear completely from our grocery stores. Send your appreciation out to honey bees and beekeepers far and wide! Support your bee love with Burt’s Bees products from Everything Summer Camp—check it out by clicking here. And, as always, thanks for reading!